This is part of the Cool Down With Agatha Christie summer extravaganza. Three participants in today’s discussion will win an Agatha Christie mystery prize pack. Like Endless Night, Ordeal by Innocence has a bit of a different structure than many of Christie’s books. In this case, the central murder occurred well before the book started. What did you think of this plot structure? Did you feel the same level of engagement and suspense in Ordeal by Innocence as in other Christie books, even though the murder occurred before the book started? Were you able to predict the identity of the murderer? Thanks for participating in Cool Down with Agatha Christie this summer! 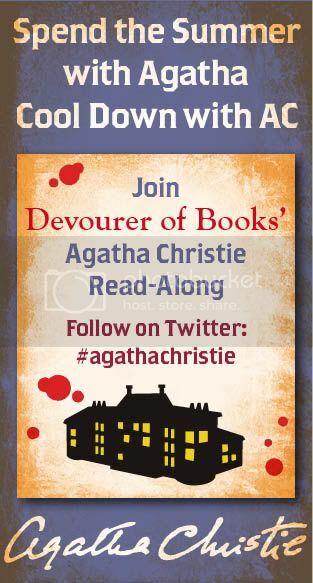 This post was written as part of my participation in Cool Down with Agatha Christie, sponsored by HarperCollins. I have this one and need to get to it – it will be my first Agatha Christie! I’ve very much enjoyed reading the stand-alones and seeing the small experiments AC makes with their structure. I get the feeling she liked leaving Poirot behind, though she doesn’t stray too far from the investigation and drawing-room revelation pattern in Ordeal By Innocence. Ordeal reminded me of a Ruth Rendell I read recently, called Sins of the Fathers, which is also a reopening of a grisly crime from the past. In Sins, an old woman is bludgeoned with an axe, rather than a fire poker, but the accused, as in Ordeal, is dead (hanged for the crime rather than having died in prison.) As in Ordeal, the troubled relations of the victim had plenty of opportunity and motive for her killing and the question becomes whether justice was properly served. The two novels have enough in common that I wouldn’t be surprised if Ordeal had some influence on Ruth Rendell. I can’t say I’d spotted the killer in Ordeal early on; but then again, I’ve taken to reading Agatha Christies with one eye closed against the red herrings and obvious clues. As in all of her works, AC is careful to give each character a perfectly plausible motive for murder, and the point of them, for me at least, is to watch the intricate narrative as it unfolds, rather than guess who the killer might be. Like Hastings, I almost always get it wrong! Thanks for leading this great Read-Along, Jen! I guessed wrong, I thought it was Mary! Damn. Ha! I totally get that, I was so impatient for someone to die in ENDLESS NIGHT, but in this one I didn’t really care whether anyone else died or not. I liked this book immediately. I knew I did because it seemed like I was getting through it so fast. Granted it took me all day to read it (approx. 12 hours or so), but actually that’s pretty fast for me! It immediately grabbed hold of me and didn’t let go. Again, I’m not familiar with AC’s other books, so I’m not up on her usual structure, but I have to say, I liked this structure. It made me feel like I was part of solving the crime, but I was the clueless person on the CSI team who has no idea who to suspect. The only other AC book I have read was Partners in Crime (Tommy and Tuppence). I felt this book had a much higher level of suspense than the stories in that book, especially toward the end. It kept getting more and more suspenseful–more and more people seemed to be figuring it out and/or knew more than they were telling. I loved it! I have to say that Agatha is the master! I am usually really good at figuring out the identity of the killer, but in this one, I was stumped almost to the very end. Only when Tina was stabbed and gave her cryptic clues after regaining consciousness did I finally know who was the murderer. AC was excellent in what she did with her mysteries and I also really liked in this book that she raised questions of a psychological nature, such as nature vs. nurture and the art of parenting and the connection between a mother and her biological children. I do have to say that the very end (the exchange between Hester and Calgary) was a little corny, but I won’t fault Agatha for that little bit of lightness in this relatively dark mystery. Thanks again, Jen, for hosting this and for the giveaway of the book. I hope to participate again in the future. First I just want to tell Michelle that I’m really happy she enjoyed this one. Now maybe she will start to read her other books. I loved this one, and felt that it held up to every expectation I had of what I expect from an Agatha Christie book. The plot was engaging and I found myself really enjoying the characters. As far as the murder taking place before the book, she did this a few times, and I think the story is in some ways better for it. I know, Ryan! Finally! This book has really made me a fan. Perhaps one Agatha a month is in order. I totally support one Agatha a month, I may have to keep doing that now that the big summer event is over. I wasn’t sure I liked this book at first. After all, I’m a HUGE HP fan and I like the tidiness and the neatness in which an HP murder is presented, investigated and then solved (yes, I like the gathering of the suspects in the drawing room). Since the murder occurred in the past, I guess I kept waiting for it to be “recreated” so to speak. I guess I am, too, more like Hastings, in that I need those “clues” set forth for me. I thought there would be more emphasis on the crime, the crime scene, the clues, and yet, this one focused me more on the potential murderers. After concluding the book, I admit that I really liked it! Having read so many AC books, I too look for the red herrings. This time, I was focused on one character (who in the end, ended up being the true murderer), but honestly, I could not put all the pieces together and figure out why. Nothing made this character any more “guilty” than the others (I also liked Mary as the murderer). I was really just guessing. But after the killer was revealed, I did look back and there were a few “clues” that I missed, or glossed over and paid no attention. I should have read more carefully. I wanted to go with my hunch but I just couldn’t back it up. Before the summer read-along I NEVER read anything other than HP. Now, I am starting to see that other characters, like Miss Marple, and other books, like the Stand-Alones, are really worth the time reading. While I would not consider Ordeal one of my “favorites” I really did enjoy it, I was kept guessing all along, and again (like Hastings) although I may have had a hunch at who the killer was, Ms. Christie, yet again, kept me in suspense right to the end. Thanks again for hosting the Summer Read-Along! Has truly been a pleasure to see what all of your commentors think about the books and their/your favorites/recommendations for others! I finally got around to reading this and I am so glad I did. The stand alone novels along with the short stories have been some of my favorites. Even though the murder occurred before the book started the plot structure was typical Christie. A room full of suspects, the person who you think is the murderer isn’t, the person you least suspect is. I finally got a handle on who the murderer was in this one. At the start of the summer I couldn’t have guessed who it was for anything. After reading 10+ books this summer I finally have a feel for how she sets things up and for possible motives. It seems that matters of the heart play a big role in a lot of the mysteries. I recently picked up her autobiography and look forward to reading it to gain more insight. Thank you for hosting the challenge this summer. I would never have picked up an Agatha Christie novel otherwise and I have really enjoyed them.